Should we be worried about the rise of pro forma? Editor's Note: In this complimentary edition of About Everything, Hedgeye Demography Sector Head Neil Howe discusses the growing use of "pro forma" accounting and explains the broader implications for investors. There’s been a lot of hoopla so far this year about corporate America’s growing use of “pro forma” accounting—or its growing aversion to U.S. generally accepted accounting principles (GAAP), depending on how you think of it. Sure, all public companies still have to comply with GAAP, the New Deal-era accounting playbook that ensures consistent tracking and reporting of vital financials. But firms are free to supplement their GAAP numbers with figures that aren’t required by SEC regulators. Whatever nomenclature you prefer, these terms are a catch-all for the myriad ways companies may present a different picture than the one portrayed by their GAAP statements. Maybe a company wants to exclude taxes or regulatory fees that are not likely to reoccur again soon. Maybe they want to eliminate the effects of a currency shift. Perhaps they want to draw attention to an alternative metric not required under GAAP—such as operating earnings, EBITDA, or cash flow. Undeniably, over the past two decades, more and more companies have flocked toward pro forma reporting. 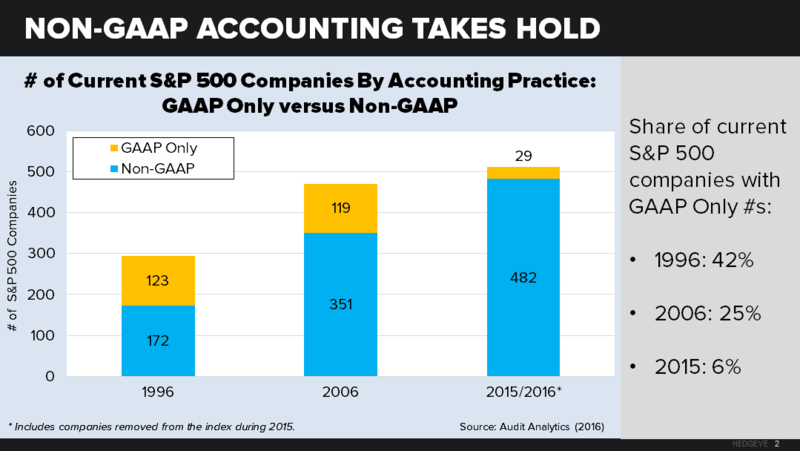 Back in 1996, nearly half (42%) of current S&P 500 constituents handed in only GAAP numbers. By 2006, that share had dwindled to just a quarter, and by last year, just 6% of S&P companies used GAAP exclusively. Certain types of companies have long been in love with pro forma—especially young high-growth companies that have just gone public or financial companies with unusual valuation issues. That pattern still shows up today. According to one comprehensive sample of listed companies, tech companies continue to show the most pro forma adjustments by number (an average of eight per company in 2015) and financial companies show the most by dollar amount (roughly $40 billion in 2015). What’s the problem with this shift toward pro forma accounting? Critics have no shortage of complaints. Companies use pro forma to artificially boost earnings. Bloomberg analysis finds that 80 percent of S&P 500 tech firms used pro forma figures in order to revise their earnings higher in the most recent fiscal year. It’s not just Silicon Valley: More than half of the Dow Industrials did the same. Firms are “leaving out” more and more types of costs. When pro forma first became popular, most companies only removed costs that were clearly extraneous to the basic business proposition—because they were either a one-time hit (like a licensing fee) or a well-understood “external” item (like taxes). Today, virtually any charge—from restructuring costs to depreciation charges to pension expenses—can be removed as long as the CFO can make a plausible case for it. Accounting firm Sanford C. Bernstein finds that the average dollar amount of recurring charges held out of pro forma statements has never been higher. Inevitably, the practice is spreading even among those who don’t care for it. If your hi-tech competitor sweeps stock options and IP amortization off the table when computing earnings, can you afford not to show a similar perspective to your own investors? Adjusted earnings undermine the purpose of GAAP. Generally accepted accounting principles were adopted to ensure consistency; a manufacturing company would use the same measures and standards as a telecom provider, a trucking company, and everyone else. But pro forma earnings reports, by their very design, are inconsistent across companies and industries. Pro forma is not all bad. Plenty of analysts and executives feel that non-GAAP reports serve a vital purpose for investors and companies. All information is good information. Remember: Pro forma isn’t replacing GAAP figures, but merely supplementing them. These adjusted reports add a layer of context to traditional earnings statements, giving investors a picture stripped of expenses (and earnings, mind you) that obscure the underlying business outlook. Pro forma is a boon to young businesses. Start-ups routinely use “pro forma” assumptions to demonstrate their ability to generate a profit. Even after these firms go public, their valuations are so weighted on future profitability that current GAAP earnings say little or nothing about how investors should value them. Any GAAP alternative is fine by me. The strongest support for pro forma accounting comes from those who believe that GAAP is an archaic, outdated tool that needs replacing. Authors Baruch Lev and Feng Gu fall in this camp. They contend that GAAP prioritizes backward-looking indicators and all but ignores future growth potential. Just think of a company like Amazon, which regularly falls short of earnings estimates and openly eschews profitability yet sees its share price skyrocket. Are all of those investors wrong, or does Amazon’s true value lie outside of what GAAP measures? The pro forma camp holds that GAAP is rooted fundamentally in a 1930s materials-oriented economy that is passing away. GAAP was an appropriate way to assess company value back when goods producers like U.S. Steel were the tentpoles of American industry. But today? What’s the use of an accounting method that hinges so heavily on inventory and COGS (cost of goods sold) when a growing share of today’s star performers—from Facebook to Google—don’t sell goods at all? Remember that the “earnings gap” widens during economic downturns. 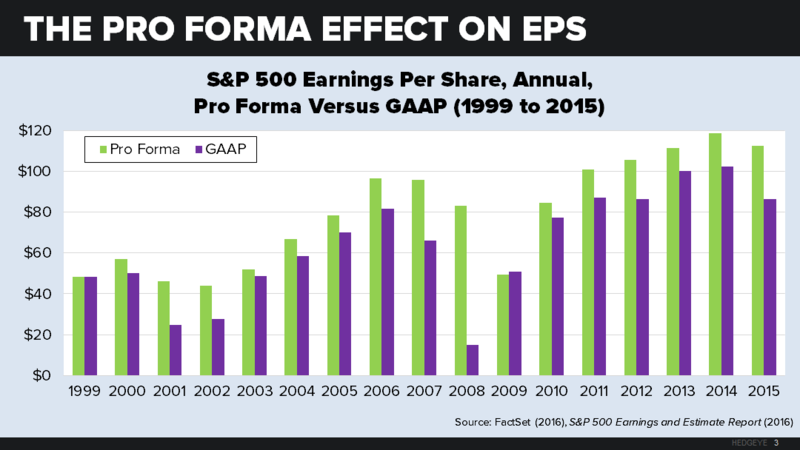 The gap between pro forma and GAAP earnings reached 23% in 2015, a yearly figure not seen since the Great Recession. In the first two quarters of 2016, however, this gap has started to close again. In hindsight, it looks like select troubled sectors sent the gap soaring last year: S&P 500 energy companies had an estimated GAAP loss of $48 billion in 2015—but a gain of $45 billion in pro forma terms. Health care companies boosted their earnings by more than $50 billion using pro forma. One interesting pattern we can observe since 1999 is that the gap seems to widen very late in the boom cycle and grow to maximum size during the following bust. In 2001 the gap peaked at just over 1.9 x GAAP earnings. And in 2008 it peaked at 5.6 x GAAP earnings. Explanation? Late in a cycle, firms are tempted to downplay the earnings deceleration. And in a recession, they will do anything to stop the appearance of bleeding—including writing off their losses as a one-time catastrophe. Late in 2015, the gap seemed to point to an impending repeat bust. The closing of the gap in 2016 may be taking us a step back from the brink. The next two quarters are worth careful watching. 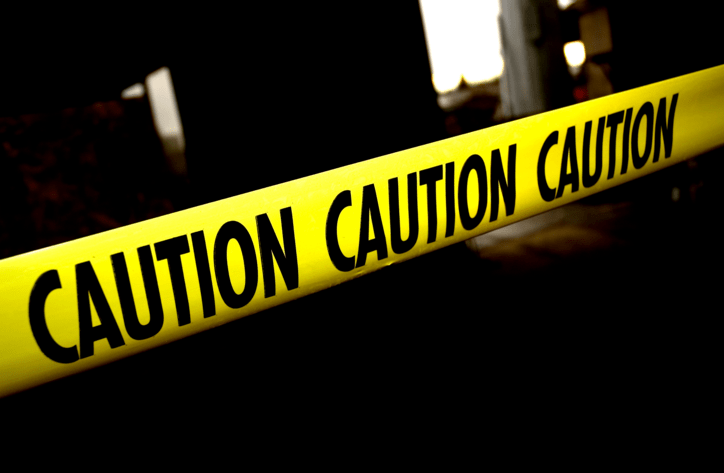 Expect regulators to turn up the heat on pro forma abusers. The SEC is making accounting consistency one of its top priorities. In May, the SEC issued interpretive “guidance” on Regulation G (which allows publicizing pro forma numbers) warning firms against a variety of possibly noncompliant practices. The guidelines are very explicit about what companies can and cannot do regarding pro forma presentation. Whether in press releases, earnings calls, or official SEC documents, GAAP figures must always be listed before any comparable pro forma figures. 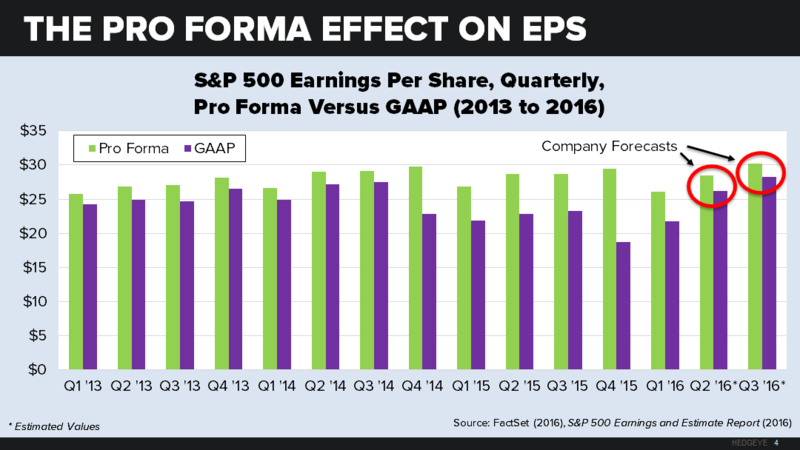 A company cannot refer to pro forma figures without disclosing that they are not GAAP numbers—for example, listing pro forma EPS as simply “EPS.” Pro forma metrics cannot even be listed in a more prominent font (larger, bolder) than GAAP numbers. Nevertheless, there are companies that stretch these rules—and the SEC is going after them. Regulators have questioned at least 80 companies in recent months (with growing frequency of late) about their pro forma usage. Tighter oversight may be contributing to the closing of the pro forma earnings gap in 2016. Get ready for growing support for a move to international accounting standards. The U.S. Financial Accounting Standards Board and the International Accounting Standards Board have been working since 2002 to find a way to merge U.S. GAAP with International Financial Reporting Standards (IFRS). To be sure, IFRS seems a tough sell for SEC regulators who want explicit rules in place for every contingency. But it’s an attractive and flexible alternative to the unstandardized world of pro forma accounting. More and more companies are issuing adjusted earnings reports that have been proven to inflate income. While critics say that companies are using pro forma to paint a falsely positive picture, supporters believe that anything would be better than our outdated GAAP system. There is growing tension between the SEC and listed firms over how earnings may be defined and publicized. The apparent impossibility of pushing earnings back into the GAAP bottle means that some non-punitive solution—whether it’s a loosening of pro forma rules or a move to international accounting standards—will eventually be needed.